7 Colorful Intermediate Piano Solos in Spanish Styles. 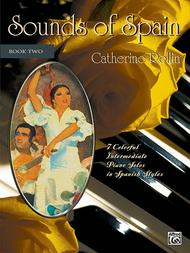 Composed by Catherine Rollin. Piano Collection; Piano Supplemental. Sounds of Spain. Latin. Book. 24 pages. Alfred Music #00-17602. Published by Alfred Music (AP.17602). "Castenets" is the real winner in this 7 piece collection - surefire excitement and fun to play for recreation or recital. "Andalucia" is a more dramatic choice while "Flamenco" certainly has possibilities. April 11, 2002 Beautiful Spanish Songs!!! People love to hear you play these songs! I would highly recommend this book to all piano players(especially intermediate to late intermediate ones) who want to find a great book of Spanish songs!